Home/Technology/Internet/Cloud Migration: Is it worthwhile? Cloud Migration: Is it worthwhile? 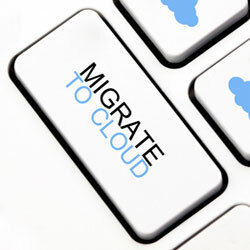 Cloud migration is the process of transferring data from local computer to the internet. Cloud computing appears as a better and invincible technique as it was ever before, which means it is no longer on the horizon. It will be easy to adapt for early stage and beneficial for all size of businesses. One of the hurdles to cloud adoption is security. Generally, perception about security is that “something that is visible is more secure rather than invisible”. That’s why many people believe that house system is more safe and sound as compared to that of the cloud. Because it is placed inside the premises and on this basis, they opposed to adopting more beneficial and secure data center. But in fact, invisible doesn’t mean to be insecure. Sometimes, however, the cloud just isn’t right for every solution. Below we’ve listed the advantages and disadvantages of data security in the cloud. Resiliency and privacy are two important areas to data protection. Just make secure your applications and leave the responsibility of infrastructure’s security on the cloud provider. Data remain safe even in the event of device theft or loss as it’s not stored locally. Cloud vendors making their system more secure by investing time and money. Potential points of interruption are minimized by a cloud by catching it behind accurate secure access points. Reasonable authenticated locks are applied and can be accessed by users only on a distance of few clicks. To maintain such infrastructure at premises requires huge investments. Reallocation in terms of responsibility, with the source taking on the load.You have to trust your service provider and clearly mention the requirements to make sure security. Although certain regulatory requirements are not fulfilled to access data on the internet. Access to the cloud is one of the hot topics. How should they give access? When and how access should be sought? Discussions not only focused on access but also on leaving the cloud. Generally, it is assumed that once access to the cloud should be made and transfer data, it’s not possible to leave the cloud ever. However, this perception is not based on reality but it’s also just not like a cakewalk. It purely depends on the usage of the cloud. You can demand your data from your cloud provider through hard drives by occurring little cost. If you are solely dependent on the cloud, you have to acquire services of a technician for transferring back your data to premises. Here are some advantages and disadvantages of data access over the cloud. You can access data at any time, from anywhere through the internet. Eliminates chances of human errors, physical damage to system and theft. No need of slow and complex VPN connection for remote employees. Any device can be used to access. Must have internet connection for accessing your data. Higher security from end point required when it can be approached from public web. I'm the writer of nogentech.org.